Translucent window film: permits light to pass through but diffuses it so that persons, objects, etc., on the opposite side are not visible. Window frost, sand blasted and acid etch glass are terms used in the treatment of glass to make it translucent (or make objects opaque or obscure). Acid-etched glass was developed in the mid-1800s and became popular in drinking establishments because it shielded patrons from view while letting in natural light. Today, frosted glass films and etched glass window films are used to achieve the same effect at a fraction of the cost of the traditional glass treatments. Not sure which film to choose? INTERNAL FILMS: The following films are our best sellers. 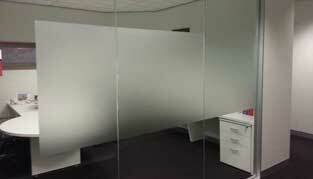 White Frost may be installed for day and night time privacy. 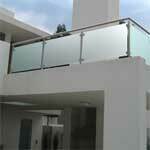 Many customers like a minimalist solution and this film provides a clean, light, contemporay appearance. It complements the beauty of stained timber. White Frost is a polyester film (made from the same material as solar control films) that allow the light to pass thru while providing privacy both day and night. This film cannot be computer cut. The LG Dusted Crystal has a matt appearance. Being a vinyl it is thicker than the White Frost which is a polyester film which allows it to be fed into a computer cutter - ie lettering or designs can be cut into the film. Diamond Dusted is a clone of 3M Dusted Crystal. 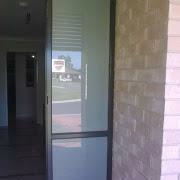 Similar warranty and appearance to 3M Dusted Crystal at lower cost. It is a durable, high performance cast vinyl glass film, offering a 3 year vertical outdoor, 5 year direct-sun indoor, and 15 year internal office partitioning warranty. Diamond Frost is a clone of 3M Frosted Crystal.